To Innovate You Must Be Free To Fail! Failure is part of moving forward, it's part of Innovation. Industry changes the world through Innovation and work. 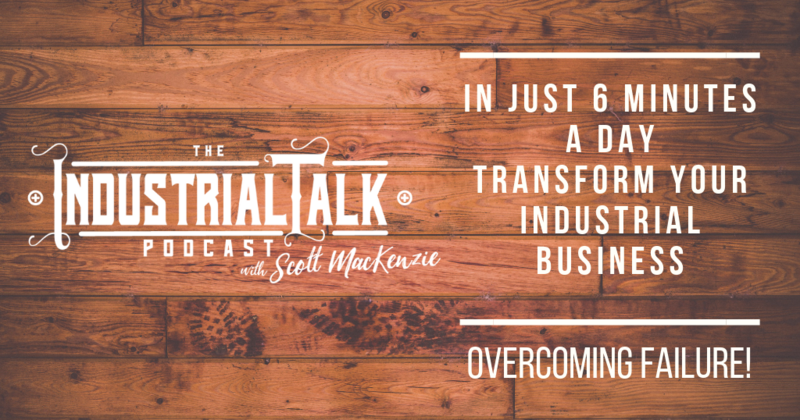 In this episode of Industrial Talk we talk about the 90/10 rule and the need to freely Fail. [00:01] The industrial talk podcast GO-BIG in just six minutes a day. Building a legacy of success in a rapidly changing industrial market. [inaudible] right. Welcome to the industrial talk podcast. My name is Scott MacKenzie. I am so glad that you were here. You would dust real pro you industrial business. We're going to be talking about overcoming failure. So let's get going. We're changing the world out there and that's what you're doing. [00:27] And to change the world, you have to Innovate and to innovate, you fail. You have to fail or you won't be able to innovate. That's just the, the whole thing about it. We're going to talk about the ranges of failure and what's important and why you as an industrial pro, as an industrial company are so valuable to the betterment of this world and people. So, and it comes through failing and overcoming that failure and keep on going, you know, talking about grit. So anyway, before we get going, we've got to talk a little bit about and quick about that Industrial Toolbox, that is Active Campaign. That's your CRM. You need it. Bomb Bomb that brings out the human side of your emails to your customers and prospects. That's important. Great tool by the way. And then we're talking Social Jukebox and that is an automated solution for you to keep in front of your customers and your prospects. [01:20] I introduced a company called Bliss Drive, B L I S S drive gotta be about SEO and getting noticed out there because if you're not on the first page of the search results, forget it. You're losing business, you're losing money, great investment there. And then finally, Feedly, which I'm going to go into a little bit more detailed at subsequent podcast, but that's a powerful tool and it, it allows you to continue to keep contact with your customers and prospects with valuable content. So those are yet, and of course we're about education. Once again, it does Industrial Academy and the Industrial Dojo is where you'll find all of this stuff for you, the pro to be the best you can possibly be in the industrial world. Okay, we're going to talk a little bit about overcoming failure now. It's going to happen if you're going to, and, and one of the problems that we have within let's just say the industrial world is that we don't like failing. [02:18] We don't like that feeling of failure. We don't like to experience failure and, and it can come into many, many sort of areas of, of our day to day life. But the, the bottom line is that if you're going to innovate, which the industry industrial market does well, is innovate, you're going to have to push that envelope and that pushing the envelope is going to require failure. Now we're not talking about, um, the, the range of failures which I've put down here. It's like an intentional decision not to do something, uh, and, and harming the company. That's a failure that you like. No, you don't do that. It's proceduralize or it's got, it's got a process or whatever might be there is, there are individuals out there that will intentionally try to go around that. And that is not the type of failure we're talking about. [03:11] And we're not talking about the failure of, of, okay, the process, the procedures are out there. But you've got that lack of ability. That's just a training issue. That is a training challenge, which is very important and it must happen. You must train to avoid those type of failures. And that's the ability failure. I don't have enough bill, uh, ability to be able to do it. And so I fail because I just don't understand. And then there's the failure of a complex process, too complex for anybody to truly succeed at because it's just too many steps, too many if Ann's, and those are the type of failures that we can, we can resolve by cleaning and streamlining processes and helping people succeed by following the process that is clearly laid out. Know what I'm talking about, our failures that are associated with testing, hypothesizing, um, exploring. [04:20] Those are the types of failures that have to happen within your business. So I look at it this way. You've got a business and you'll say, okay, but 90%, 90% of your business is predictable. Proceduralized, uh, has defined processes, 90%, and it goes working day in and day out outside of the fact that there might be some deviant qualities. Uh, or people who are trying to go around it don't. So 90%, I look at it, 90% of your business is pretty sound and it has grown and evolved over time and saying, do this, don't do that. We act this way. We don't act that way and so on and so forth. And that's how we behave as a business. That is our culture. I'm talking about that 10%, that 10% that you've got to incorporate it in your business. Because once again, you've got to fail to innovate and we got to overcome failure. [05:25] And if, uh, if you overcome it in a says, okay, here's 90%, 90%, we're going to continue to do the business the way we always have and deal with challenges the way we always dealt with it. But I'm talking about freeing up 10% of our business, 10% to truly look at other opportunities. Look at other areas that can create value. Look at new technology, look at solutions that expand your business. And by doing that, you will, uh, you will fail. But once again, failure's not a bad word. Failure in the, in the area of, of hypothesizing of what it might look like or, or exploring the opportunities. It's not a big deal cost wise. I mean you're not hurting anybody. So what I'm getting at is that 90% of your business is good. You need a car about 10% to truly explore. Successful businesses do that on a regular basis and there is special, especially today you industrial company out there, you industrial pro, there is tremendous change taking place right now and the speed of which it's taking place is blistering. [06:54] Be involved. You need to understand, and that's why I'm so passionate about digital marketing, digital sales, digital branding, it's because it is a powerful platform to be able to help you, your company, to be able to expand and grow and change the world through your innovation. You guys are special up there. Don't ever forget that. Have a wonderful day. Thank you again for joining the industrial talk podcast. We will be back tomorrow and we're going to continue on this industrial leadership road because we've got so much to do. You guys have to continue changing the world. So thank you very much for joining the industrial talk podcast. I will talk to you tomorrow.